With WWE’s Elimination Chamber 2018 pay-per-view as the next stop on the road to WrestleMania 34 for the superstars, a big match has been booked for Raw. The latest match will fill one of the remaining three spots in the men’s Elimination Chamber match scheduled for later this month. A total of six competitors will be part of the match with the winner going on to face “The Beast” Brock Lesnar at Mania. Here are the latest details on the match that has been announced for Monday’s new episode of Raw. The WWE website recently released their preview of the upcoming Raw episode being held at Wells Fargo Arena in Des Moines, Iowa. They mention that three spots have already been filled for the upcoming men’s Elimination Chamber match with John Cena defeating Finn Balor, Elias defeating Matt Hardy, and Braun Strowman winning a Last Man Standing match against Kane. That has Cena, Elias, and Strowman in the PPV match. 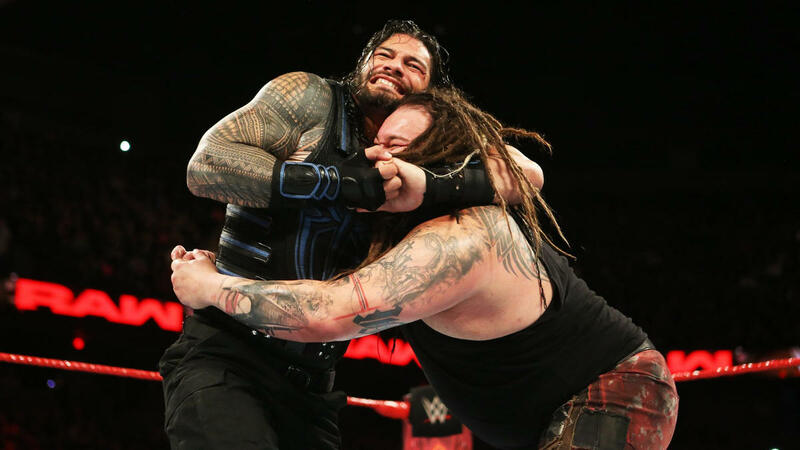 On Monday’s newest Raw episode, either “The Big Dog” Roman Reigns or “The Eater of Worlds” Bray Wyatt will be the next participant to qualify. These two superstars will battle again inside the squared circle where they’ve had several previous battles. Reigns seems to have the advantage going into this match and probably something to prove. The Big Dog not only lost as one of the final competitors in the Royal Rumble match but also lost his rematch attempt for the WWE Intercontinental title against The Miz. Now Reigns will look to get back on track and on the road to WrestleMania with a win over the always-challenging Bray Wyatt. One has to wonder if any other superstars might play a part in the way this match finishes. In a previous rumors report from the Inquisitr, it’s mentioned that Roman Reigns could be among the competitors in the Chamber match. That seems to fit in with the ongoing rumors that a Roman Reigns vs. Brock Lesnar match is going to happen at WrestleMania 34. Fans are hoping for a swerve though as there are several other superstars who are currently in the Chamber match that might make an interesting alternative to seeing Reigns challenge Lesnar.